A Citrus reticulata Blanco cutlivar. See Citrus reticulata ‘Mandarin Orange’ for a description of the Mandarin and Tangerine group. I have no specific description of this variety. This is possibly the orange described and figured at BR f.211/1817 as Citrus nobilis var. minor, the Dwarf Mandarin Orange-Tree, although it seems more likely that Macarthur’s name refers to a small fruit rather than small stature. 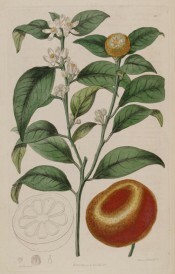 ‘An entirely distinct species from the common China-Orange (Citrus Aurantium). In the large variety (alpha) the fruit is deemed the most valuable of the genus, and called the Mandarin-Orange in virtue of its superiority. Both the large and small varieties were introduced by Sir Abraham Hume, by whom Mr. Edwards was favoured with the specimen from which the drawing has been made. Native of Cochinchina; cultivated at Canton. The fruit of the large sort sometimes measures five inches in diameter, and has a rind of deep saffron-colour. In Aurantium the petiole of the leaf is edged by broad wings and of an obcordate form; in nobilis it is linear with an extremely narrow straight edging; in the former the fruit is nearly spherical, in the latter considerably depressed, so as to be of greater breadth than depth. The plant not having been yet cultivated in any of those countries from which we are supplied with oranges, the fruit has not found a place among the articles of commerce in this country. But we see no reason why it should not in course of time; it is produced as freely as that of the others in the conservatory at Wormleybury. We have heard that the tree does well at the Cape of Good-Hope. The dwarf variety we suspect can scarcely be considered of any consequence but as an ornamental shrub.’ [BR f.211/1817]. Introduced to Britain as Citrus nobilis minor, the smaller Mandarin, in 1805 [JD]. Listed in all published catalogues as ‘Ditto ditto (small)’ [Orange Tribe no.10/1843]. This follows ‘Mandarin ditto’ in the 1843 catalogue.